Are you considering installing your own sauna at home? We’ve listed 7 reasons to stop considering and start installing! Constantly online and with an ever-diminishing attention span, we’re often not as focused on our near and dear ones as we wish we were. The sauna offers a sanctuary we’re we get to unwind and give each other our undivided attention. Are you having problems getting your teenager to look up from iPads and smartphones? Then some time together in the sauna offers a great tech pause, allowing for thoughtful communication and silent contemplation. The heat in the sauna helps us to relax and regulates the level of cortisol in our blood. Cortisol is the hormone that is released when we’re stressed, and too high levels of cortisol can lead to a number of health issues such as problems with the immune system and with sleeping. Sauna bathing reduces the levels of cortisol in our blood, and instead it stimulates the production of serotonin. Serotonin is our “happy hormone” that makes us feel good and counteracts depression. You can read more about sauna and serotonin here. Sauna has a proven positive effect on our immune system, and regular sauna bathing dramatically reduces the risk of catching common colds and the flu. 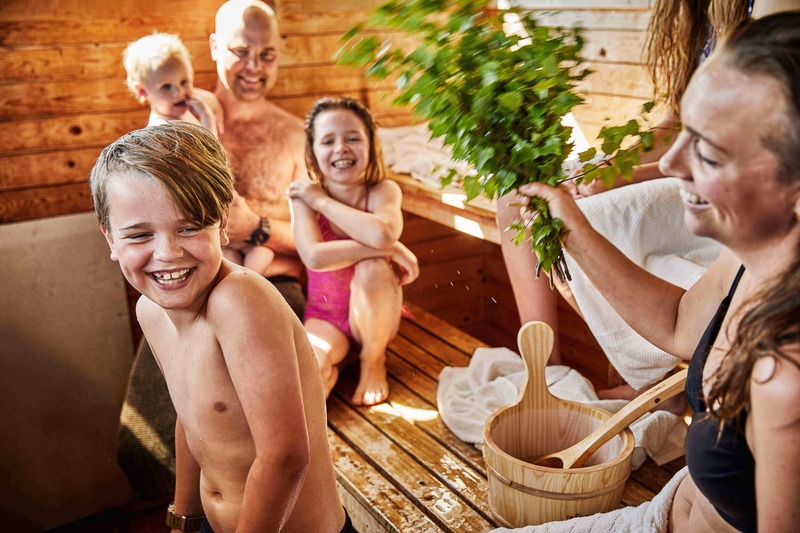 The heat boosts the blood circulation and stimulates the production of white blood cells, which in turn help protecting our bodies against viral and bacterial attacks.We have written more about sauna and the immune system here. Did you know that a hot bath can burn just as many calorie as a run? The raised temperature stimulates the calorie burn in the same way as when the body temperature is raised through physical activity. Dr Steve Faulkner at the Longborough University is behind this discovery, that he made when he let participants in a study fist take an hour-long hot bath and then he bike for an hour. What he found was that both exercises lowered the levels of blood sugar and raised the amount of calories burned equally. You can read more about sauna and weight here. The heat, the silence and the solitude will help you relax, and research have shown that a sauna session can have dramatic effects on sleeping patterns. By raising your body temperature in the sauna just before it is time to go to bed, your heated body will automatically work to readjust its temperature afterwards. It is this cooling-down and normalising after the sauna bath that will lull you off to sleep, leaving you calm and relaxed enough to sleep soundly through the night. You can read more about sauna and sleep here. Taking regular sauna baths, and especially steamy ones, can have a truly transformative effect on the skin’s appearance. The elevated heat and the increased sweating and circulation stimulates the production of collagen and deeply cleanse and rejuvenate your skin. Don’t forget to rehydrate, both from the inside, drinking plenty of water, and externally with a nice moisturising lotion. We have written more about sauna and skin here. Research has shown that regular sauna baths dramatically lowers the risk of suffering from heart diseases. A finnish study recently showed that sauna bathing can lower the risk with as much as 63%. THe study also showed that the more often you spend time in the sauna, the stronger are the positive effects on health and on your heart. You can read more about sauna, your heart and health here..